In 1982 the then Minister for Finance, Ray MacSharry, announced that a twenty or twenty-five pence coin might be designed and in August 1984 the twenty pence was chosen. The Arts Council of Ireland recommended the horse design. The twenty pence (20p) coin was introduced on 30th October 1986. It was first Irish decimal coin that was of a different size to the corresponding British coin, as the Irish pound had not been pegged to the British pound since 1979. It featured the horse (an Irish Hunter) that was on the pre-decimal halfcrown coin, that was produced from 1928 to 1967. The coin has a yellow-brass colour (some people call this nordic gold) due to its composition which is 79% copper, 20% zinc and 1% nickel. It was calculated that this composition would reduce production costs by 25% as against the cupro-nickel then used. The edge of the coin has six bands, alternately finished smooth and grained. The mass of the coin is 8.47 grams, whilst the diameter is 2.71 centimetres. Before this coin could be officially introduced, all vending machines in Ireland had to be re-calibrated to accept the new coin and the organisation with the largest number of coin-operated vending machines at that time was the then recently formed Bord Telecom Éireann. Created in 1984 from the old Department of Post & Telegraphs (a.k.a. the P&T, or stylised as P+T), Telecom Éireann were responsible for the maintenance of tens of thousands of public phone boxes at the time. In 1999 the company was privatised and renamed as eircom. With the proliferation of mobile phones in Ireland, Eircom recently announced they were reducing the number of public phone kiosks from 4,850 to 2,699 in 2014. 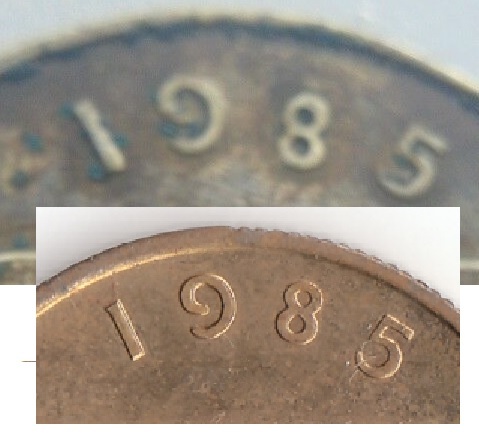 A limited number of these coins were produced by the Central Bank of Ireland the year before and were issued to vending machine engineers for re-calibration. All were supposed to return to the Central Bank to be melted, but some seem to have slipped through. Firstly, these coins were dated 1985, as it was against the law to provide coins with a future date. Secondly, the coins were supposedly intended to be returned. In 1985 and early 1986, a small quantity of these 1985 20p coins were passed around to engineers working in each county – not all were returned. Finally, the Central Bank of Ireland allowed the 1985 coins to be used as legal tender in the public domain, apparently due to the laissez-faire nature of the regulations, or lack thereof, concerning the coins being given to the engineers. There were lots of other coin-operated vending machines back then – parking meters on the street, cigarette vending machines in pubs and clubs, etc. and, presumably, all had to be re-calibrated before 30th October 1986. Presumably, this was not as big a job as the public phone box network and these other vending machines might have been re-calibrated in early 1986 using ‘pre-release’ 1986 20p coins. The only engineers reported to have been issued with 1985 20p coins were P&T Engineers and some of these seem to have been clever (or fortunate) enough NOT to have returned the coins. And finally, people often ask me how much is a 1986 Irish 20p worth – you can easily work this out for yourself by looking at the table below – showing the mintage figures for these coins. 1985 500 minted, but it is thought that 50 were never returned ! In theory, there could be a few more out there … just waiting for some lucky person to find them. Do you have a jar of old Irish coins at home? Is there a 1985 Irish 20p coin in it? Meanwhile, we continue to see ‘debatable’ coins appearing on eBay and people continue to bid on them. For example, this eBay auction ended on 10th August 2014 and if we examine the date, we might be tempted to shout “fake” but there were 102 bids (from 7 different bidders) for this one and it sold for €811 (approx. $1,077.41) + postage on the day. I, personally, would NOT have bid on this coin. On 12th August 2014, the coin at the top of this image sold for €811 – which might seem like a good deal – but take a careful look at the figure “8” and one might begin to have serious doubts about the authenticity of this coin??? The “5” doesn’t look too good either. The seller did not say it was genuine. The seller admitted to not knowing anything about coins. In my opinion, the buyer only has themselves to blame on this one ! ← O’Brien Rare Coin Review: Why is the 1938 Irish Penny so valuable? how much would a 1995 be worth? Hello I have a 1992, 1994 and 1996, can you please tell me what they are worth? The only 20p coins that are worth much more than their face value are those minted in 1985. In average circulated condition, about 25c each. If its a genuine coin, its worth quite a bit. Beware of fakes – especially replicas coming out of China. Although they are sold as replicas and not intended to deliberately deceive, they do cause confusion when passed on to relatives withou an explanation of where they came from.